The Union Finance Minister Shri Arun Jaitley today said that the Government was working on a slew of sectoral reforms, including a new law on fast track arbitration, in a bid to address the stressed areas of the banking sector. 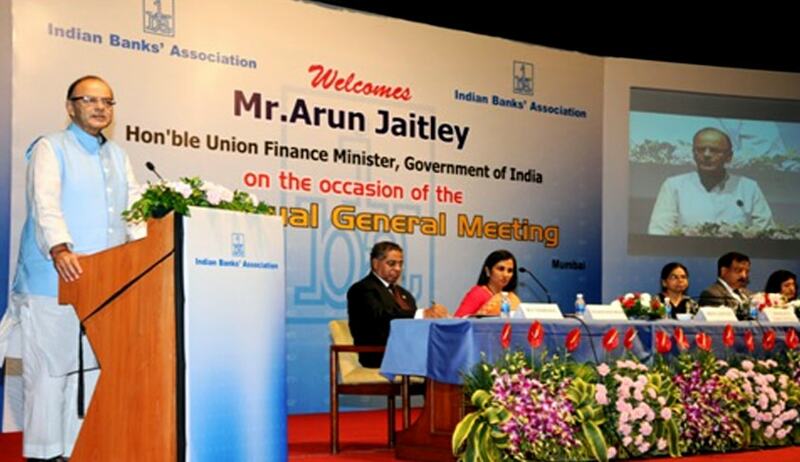 Speaking at the 68th Annual General Meeting of the Indian Banks’ Association (IBA) in Mumbai today, the Finance Minister Shri Jaitley said the Government was aware of the challenges faced by the Public Sector Banks (PSBs) and measures were being taken to address each one of them. The Finance Minister said sectors such as steel, power, highways and discoms were mainly responsible for the stress in Public Sector Banks (PSBs). In a stern message to the State power utilities, the Finance Minister said that the banks cannot be expected to bail out the defaulters. He observed that very few States had carried-out power sector reforms and the situation would not improve unless the users were made to pay for the electricity consumed. Mr. Jaitley informed that the Reserve Bank of India has already put four State Governments’ on notice. The combined debt of discoms is estimated to be more than Rs 3 lakh crores leading to acute financial stress in the banking sector. The Finance Minister Shri Jaitley described the problems of the steel sector to be on account of external factors, where cheap imports are hurting the domestic industry. He said much progress had been made in the highway sector and the projects were being implemented without major bottlenecks. Mr. Jaitley informed that the review of the stalled projects was now being done at the Prime Minister’s Office level and road blocks were being specifically addressed. The Finance Minister asserted that the number of stalled projects has decreased considerably. The Finance Minister Shri Jaitley further said that the Government has made considerable progress in addressing the issue of ease of doing business. He said an Exit Policy is in final stages of preparation and the draft will be put out for deliberations early next month. He also said the proposed new Arbitration Law provides for Fast Track Arbitration with one member Arbitration Board, with a mandate to complete the entire process within six months. Shri Jaitley also said the Dispute Resolution Tribunals (DRTs)’s working was being speeded up by moving most of the transactions online. The Finance Minister Shri Jaitley reiterated the Government’s commitment to give operational freedom for the PSU banks. “The Public Sector Banks (PSBs) have to be given a lot of independence. Of course, they will be carrying-out the developmental agenda of the Government, but their administration has to be based purely on banking considerations” the Finance Minister Shri Jaitley added. The Finance Minister said the Government may consider reducing its stake in Public Sector Banks (PSBs) to 52 per cent, giving additional financial strength to banks themselves. “We have come-up with a re-capitalization programme for the next four years and hopefully this would induct capital strength in to the banks and improve their capacity”, Mr. Jaitley added. The Finance Minister Shri Jaitley also informed that a high level committee headed by Justice A P Shah, former Chairperson, Law Commission was looking into the options available for Public Sector Banks (PSBs) to recruit the best talent from the market. He said “efforts are on to give shape to the Banking Bureau and to professionalize all personnel issues”. Mr Jaitley however opined that the brick and morter branches may probably lose some relevance in future with alternative internet based channels emerging. Earlier, Ms. Chanda Kocher, CEO, ICICI Bank spoke about the challenges being faced by the banking sector in the country.